Geography was my favourite subject in school; physics the one I disliked the most. 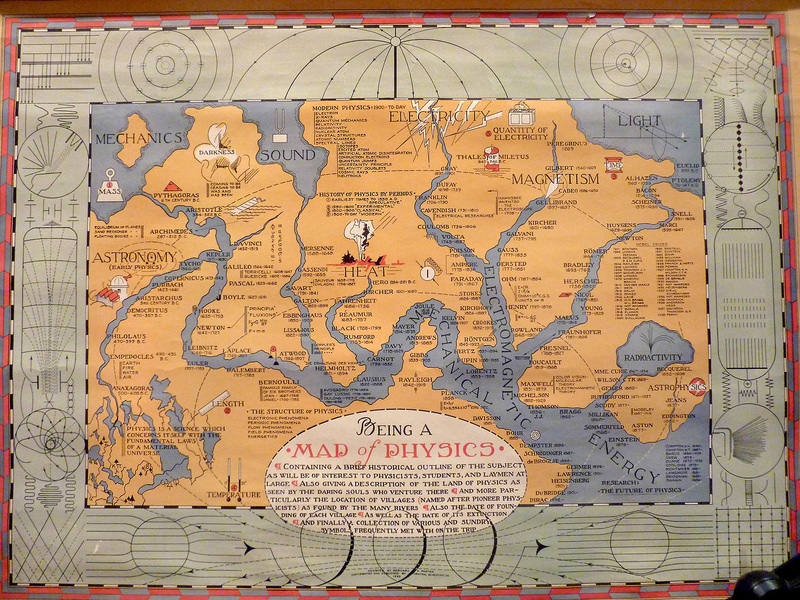 If only I’d known about this Map of Physics! This spatial representation of the subject, dating from 1939, defines itself as Being a map of physics, containing a brief historical outline of the subject as will be of interest to physicists, students, laymen at large; Also giving a description of the land of physics as seen by the daring sould who venture there; And more particularly the location of villages (named after pioneer physicists) as found by the many rivers; Also the date of founding of each village; As well as the date of its extinction; and finally a collection of various and sundry symbols frequently met with on the trip. Perhaps, by representing physics as a continent and its main branches as rivers, it would have made that vast, mysterious subject more graspable to a mind more attuned to geography. And maybe, by populating its districts with villages named after famous physicists, the relation between those pioneers and their field of expertise would have been easier to memorise. Those fields are, left to right and top to bottom: Mechanics, Sound, Electricity, Magnetism, Light, Astronomy, Heat, Mechanical and Elecromagnetic Energy, and Radioactivity. The map is more than a random representation of the different fields of physics: by displaying them as topographical elements of the same map, it hints at the unified nature of the subject. “Just like two rivers flow together, some of the largest advances in physics came when people realised that two subjects were [like] two sides of the same coin”, writes Jelmer Renema, who sent in this map. Another example: along the stream that represents Astronomy are listed, in more or less chronological order, such contributors to the field as Anaxagoras (500-428 BC), Empedocles (490-430 BC), Philolaus (470-399 BC), Democritus (470-357 BC), Aristarchus (3rd century BC), Purbach (1423-1461), Copernicus (1475-1543), Tycho [Brahe] (1546-1601), Kepler (1571-1630) and Galileo (1564-1642). Across the map are strewn some observations about physics, including its definition (“A science which concerns itself with the fundamental laws of the material universe”), its structure (“Electronic, periodic, flow and field phenomena, and energetics”), its history (“Speculative, experimental, classical and modern periods”) and even a list of Nobel Prize winners, up until the 1938 laureate, Fermi. If the scientists’ names represent settlements, they mimic real-life toponymy in at least two respects. Some names appear more than once: Newton appears on the banks of the river leading from Light to Electromagnetic Energy, on the opposite bank of Huygens; but also between Hooke and Leibniz, on the shores of the stream between Astronomy and Mechanical Energy. Another similarity with actual place-names: while some names still ring out with the familiarity of world fame, others have faded into obscurity. Heisenberg and Einstein appear in the southeast, close to The Future of Physics; ancient luminaries like Euclid, Pythagoras and Aristotle mingle with more recent worthies like Faraday, Fahrenheit, Becquerel, Geiger and Röntgen. But who were Soddy, Rowland, or Pupin? Sounds like we need a new map! Many thanks to Mr Renema for sending in this map, found here on The Quantum Pontiff, a blog about "the wondrous quantum world in which we live".